The stylish Morningstar Bay Rover 498R is designed with your family in mind. The transparent low profile windscreen provides a suitable shelter for everyone on board, while the simple layout, featuring two skipper chairs up front and a foldable bench at aft, provides a large and flexible living space for the whole family, even for enthusiastic fishermen. 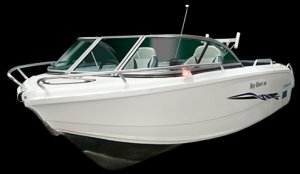 The Morningstar Boats are revolutionary because of their unique aluminium plate formed hulls. During forming, thousands tonnes of force is applied on premium aluminium plates and the material becomes a little liquid-like, evenly spreading on dedicated design dies. Flat plates become complex shapes. This allows the single plate bottom of Morningstar Boats to incorporate reverse chines, strakes, and variable deadrise, and eliminate an external extrusion keel. Additionally, side plates and gunwales can now be integrated into a streamline shape with second chine and flared-bow. Together, these formed plates give the hull outstanding hydraulic properties, static and dynamic. That's why we call it the Hydro Hull. Strength is another important characteristic of the Hydro Hull. The formed plates act as a strong outer shell, an exoskeleton. This 'unibody' concept might seem familiar, because it is highly popular with high-end sports cars, airplanes, automobiles and top-end bicycles. No longer dependent on frames alone to provide structural strength, the net result is a stronger, lighter and more rigid integral structure. Special folding technology are also used to construct stiffeners and transom. Folded stiffener system and transom dramatically decrease welding and increase rigidity and durability. Hydro Hull take things another step further: a rigid shell means robot welding is now a possibility. Robots are blind and can only follow fixed paths. If the deviation between pieces is greater than 1mm, parts cannot be welded by robots. High-tech forming turns flexible plates into self-rigid exoskeletons and keep the deviation under control. The end effect is that we are able to consistently reproduce identical welds on the Hydro Hull time and time again. Utilising forming process that minimize number of pieces required, such as by turning the side plate and gunwale into one, we avoid the many structural and weld defects associated with traditional methods. In the past, complex and therefore usually more hydrodynamic hull designs are reserved for the fibreglass boats, while aluminium boats are limited to simple developable surfaces. Not anymore. With our experience in the field of metal forming, we overcome these obstacles and present to you an aluminium hull that handle excellently in the water. The hydro hull combine the aesthetic appearance of a fibreglass hull design with the robustness and light weight of aluminium.